It’s that time of the year again… as we leave behind the long summer days and the warm weather we can begin look forward to the crisp cool autumn air, the changing colors of foliage and the start of the holiday season. In the world of coding we can also look forward to the oncoming changes to the ICD-10 CM code set. October 1, 2018 will mark the third update to the ICD-10-CM code set. Whether you’re a coder, a provider, payer, or consultant these new code changes will impact you. With a total of 473 code changes including 279 new codes, 143 revised codes and 51 deleted codes there is a great deal of change on the horizon for 2019. 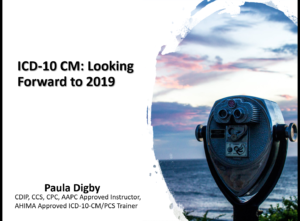 In this session we will look at those changes to prepare you in your look forward to another year of coding accuracy with ICD-10 CM.